The Prominent Paint Access range consists of the ‘essential’ four products that will cover 90% of the market’s needs, including an Acrylic PVA, Basic Matt, a Gloss Enamel and a Plaster Primer. Prominent Paints, a brand that is traditionally under-represented in the low end of the market expects its new offering will help alleviate the mounting pressure on consumers’ wallets which are already stretched – a phenomenon not expected to change in the near future. The new Access range consists of the ‘essential’ four products that will cover 90% of the market’s needs, including an Acrylic PVA, Basic Matt, a Gloss Enamel and a Plaster Primer. 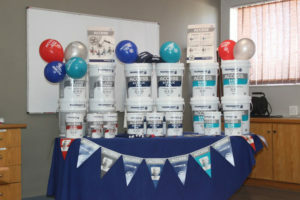 According to Prominent Paints marketing manager, Carolien Haden, the company sees the huge potential of this market, which is all about volumes and pricing, and expects this range to be of great benefit to its many independent retailers, franchise stores and paint centres around the country. “As a brand leader, we need to be represented in all categories and to serve the entire market and by launching a line of products for a budget consumer market, we are on our way to achieving this. With this new range we also expect to increase our market share,” says Haden. The packaging design enforces the Prominent Paints brand and product names clearly defining the range leave nothing to interpretation. Distinctive colour coding has been applied to each line in the range and pack sizes fulfil the specific needs of a specific market with a 5L and 20L available across all the ranges, bar the enamel, which comes standard in a 1L and 5L tin. “We anticipate the Access Range to be well received by a market already willing to purchase a local brand they trust and are already familiar with and look forward to delivering value to this sector,” concludes Haden. The Access range is stocked at most leading paint stockists nationwide, as well as from the Prominent Paints Paint Centres and franchise stores. The suggested retail price for the most economical paint is R18.95/L with the highest price point in the range for the gloss enamel is at R62.60/L. Prominent Paints claims that benchmarking studies have indicated that the quality of the Access range is equal and in some cases superior to competitor brands in the low end of the market.